Japan coming out of the doldrums? After 28 years of stagnation, the Japanese economy may be getting to its feet again. Coupled with gigantic savings accumulated over decades from overseas surpluses, and soaring yen, Japan tried a number of measures to weaken its currency. First it began to buy up properties overseas, such as the Rockefeller Center in New York City in 1990, as well as investing in US corporate bonds. After huge property losses, it gave that up. Another was state intervention BOJ in foreign exchange reserves, which it ultimately gave up in 2004 after accumulating nearly a trillion dollars. Japan also invested directly in Fannie Mae and other mortgage bonds, holding close to a trillion dollars in those bonds. Yet another measure was to loan out hoards of money to US and European banks at zero percent rates, which began in earnest in 2004, also known as the massive carry trade (via yen-denominated bank loans to overseas investors). US and European banks then loaned this money out to home owners in America, as well as big property investors in the Middle East. This effectively kept the yen at 120 or weaker levels to the dollar. Endaka was tipped off again in 2008. The yen moved from the floating near 120 to floating near 90. This is thought to be the first time endaka contributed to a worldwide recession, instead of just a Japanese recession. While the proximate cause of the recession is widely thought to be an increase in credit defaults (largely outside Japan) causing a loss in confidence in the credit markets (a credit crisis), the yen was funding these investments through the carry trade, where loans were made at near zero interest rates in yen to finance the purchase of non-yen debts which had higher interest rates. 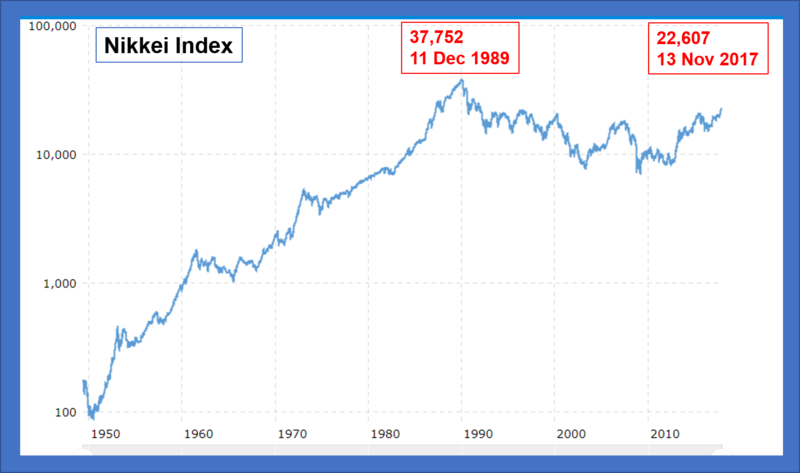 From a high of almost 38,000 in December 1989, the Nikkei Index dropped to a low of 9,000 in January 2009. At the end of last week the index had reached over 22,000. Abenomics has not led to any spectacular recoveries, but the mood is lightening. This entry was posted on November 13, 2017 at 9:08 am and is filed under Economics, Japan. You can follow any responses to this entry through the RSS 2.0 feed. Both comments and pings are currently closed.